Hands-on review of a wireless kit. One of the best aspects of my job is test-driving new AV products. Much to my chagrin, however, I simply don’t have the time to review everything on my wish list (cue the tiny violins). But after months of planning, I finally got a chance to put the Lectrosonics UCR100 wireless system through its paces during various conventions, lectures, and conferences. And I’m glad I did. From start to finish—out of the box to out in the field—the attention to detail was impressive. It’s one of the more reliable, user-friendly wireless systems I’ve operated in the past decade. The 100 Series system was designed to work with small video cameras, so keep that in mind in terms of your organization’s specific production and or videography needs. After using the system for approximately 70 hours with Canon and Panasonic high-definition DV camcorders, my team experienced exactly zero drop-outs. (And believe me, we tried.) The system offers 256 selectable frequencies over a 25.6 MHz band to avoid interference from any pesky RF sources. This system offers exceedingly simple operation; it’s as plug-and-play as a wireless mic system can get. There are no extraneous nobs, controls, or jacks beyond the line out, audio level, On/Off, and the RF indicator light. Bonus: the UCR100 receiver instructions are clearly stated right on the chassis. This is beneficial if your organization, like mine, relies on interns or shares the system with another department. Basics: the frequency switch settings must match in receiver and transmitter. Set the transmitter gain first. When the gain is set properly, the -20 dB LED will always light with audio, and 0 dB will occasionally flicker. Just set it and forget it, adjusting the frequency as needed. The UCR100 receiver offers highly sensitive operation; the matching transmitter provides 50mW of output power. The result is a really healthy operating range. After 70+ hours of recording in stationary conferences, crowded convention centers, university auditoriums, walking on campus, and in moving cars, we had no drops. We only used one receiver/transmitter, so there were no issues or the occasional interference/crosstalk that can emerge when using multiple mics. Mindful of unintentional signal blockage, I kept the transmitter antenna free/unobstructed; we always achieved maximum range and performance. It’s a rugged alloy antenna that with a really sturdy design. This product is battery-driven, naturally, so there is no option to plug in an AC adapter if needed. Of course, it is designed for true wireless operation, so there is no surprise there. Nonetheless, keeping extra batteries on hand is always a good idea. If this basic best practice eludes you for some strange reason, no worries; the Power LED will start blinking with three hours of operation remaining. Again, this is a nifty feature if your organization is sharing the system. The battery compartment is well designed; just push the door away with your thumb, then swing the door open. No screwdriver required. Therefore, if someone is careless with the device (I’m looking at you, Stan) and happens to drop it, the battery door will not pop open accidentally. The 100 Series system offers a lightweight, super compact form factor on both the LMa transmitter and the UCR100 receiver, but don’t be deceived. It’s machined-aluminum construction for rugged use; it really stands up to the occasional drop, heavy wind, and late-for-my-plane-security-belt transport. 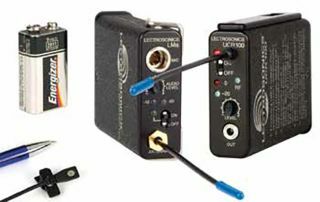 The LMa transmitter & receiver are electrostatic powder coated for superior scratch and blemish resistance. The system comes bundled with a 15-inch MC100XLR audio interface cable configured for unbalanced mode (at 45 dB attenuation for camera mic inputs). This is a good option to have if your facility uses multiple cameras. The system comes bundled in a low-profile, black travel case for extreme portability. It’s easy to bring through plane security, on trains, automobiles, bikes, and even bipedal motion. You might dismiss it as a basic feature, but it’s so streamlined and well designed that it brings user-friendliness to the next level. The LMa transmitter clip is a strong, heavy-duty spring steel for reliable belt-wear during a shoot or production. The mic also has a strong clip for secure lapel or lav applications. The mic cord hits the sweet spot; it’s just the right length with no extra cord to get tangled, but long enough for virtually any mic’ing need. We mostly used it during conferences and interviews. The 100 Series system offers excellent audio quality: no tinny-ness, great range, great consistency sound. Tune the frequency as needed. After using the product with myriad presenters during interviews, lectures, and seminars, we experience no popping “P” sounds or hiss. I didn’t run into any problems with the transmitter’s input gain; it should be adjusted so that the loudest sound level that will occur with no distortion. As a basic rule, I always keep the receiver away from digital equipment that could emit annoying RF noise. For the price and long-life expectation due to the durable construction, this is a great value. The system including transmitter, receiver, and lav mic MSRP $2,093 and a street price of around $1,475. Lectrosonics gear is made in Rio Rancho, New Mexico, by an enthusiastically self-proclaimed “bunch of fanatics.” There is a sense of pride that accompanies the equipment—from the playful company branding to the smart chassis design. After using the 100 Series for a few weeks, it’s clear that Lectrosonics isn’t just a product—it’s a mindset. Margot Douaihy is the editorial director of AV Technology magazine, EDUwire, and Tech Manager Today.